Document all the nine months while it's still just the two of you with this lovely pregnancy journal. For the first nine months, it's just you and your little one. Every kick, every craving, every inexplicable fit of tears over an emotional household cleaner commercial. Document all those sweetly unexpected moments with this beautifully bound pregnancy journal. 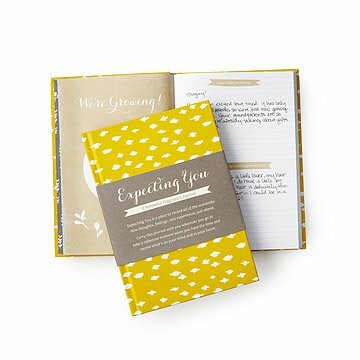 A bright place to record your thoughts, feelings, and experiences while carrying your child, this prompt book offers pages for your cravings, your hopes for the future, preparations for your little arrival, and more. The result is a beautiful keepsake you'll want to share with your child, long after those nine months when it was just the two of you. Made in China. My friend cried when opening this as a surprise gift. Beautiful gift, unique, well made, interesting prompts and organization. Yes I would definitely buy this book again!! A keepsake! I love the fact I can keep the memories of my daughter's pregnancy and first grandchild!! The book makes it possible for myself or an expecting mother to use!! I can add my own special thoughts and memories for them to keep for years to come!! I have lived this and will buy again. I wanted a low-key journal to chronicle my first pregnancy. I love the design of this journal, both the aesthetic and the contents. For writing, I like the simple prompts as well as the open space. My daughter's first pregnancy needed a amazing gift but also a keepsake. She is sophisticated and mindful which made this journal perfect! From the most beautiful cover to the thoughtful pages, this journal helped me express my love/excitement and now will let her express her love and thoughts for her baby. Many thanks and gratitude for offering such a wonderful product at a great price. It truly was a wonderful no stress shopping experience. Would definitely purchase again for any new mom to be! I would highly recommend this gift! This journal is a must have to record all those firsts and special moments throughout the months leading up to that special birth day. As a mother of 5, I would've loved to have one for each of my bundles of joy! Each pregnancy is different just as each child is different. Those unique memories are wonderful to share with your family as they grow up and start their own families. So cute and better than I expected! I bought this when I found out I was pregnant and I've been loving it ever since. I like how it has prompted writing, but even options for journal thoughts. It'll be fun to read again some day! I love the simplicity of this pregnancy journal. Some of them on the market get a little too carried away and ask ridiculous questions for you to fill out. The quotes included in this journal are also so sweet, would bring me to tears. The layout is just perfect and I am very happy with the journal. Got as a Christmas gift for a friend. She loved it! My daughter-in-law is so organized...this book can keep her thoughts together!